Rental rates cover 4 people. Add $5 per person for each additional person over the 4 included. Where permitted, pets are charged $10/pet/night, maximum 2 pets/rental. Pets are welcomed in these cottages for an additional fee. See above below "Rentals" for other information about pets in our rentals. The covered wagons encircle a fire pit and BBQ area with plenty of room for individual food preparation and campfire activities. Each has electricity and 4 army cots. Bedding not included. Our pet friendly Safari tents sleep 4 on army cots. They have a locking door, screened windows, ceiling fan, lighting and electricity. They are located a few steps away from the pools, store, hot showers and restroom. Outside, a BBQ grill and picnic table add to the appeal of outdoor living. Pets are welcomed in this cabin for an additional fee. See above below "Rentals" for other information about pets in our rentals. 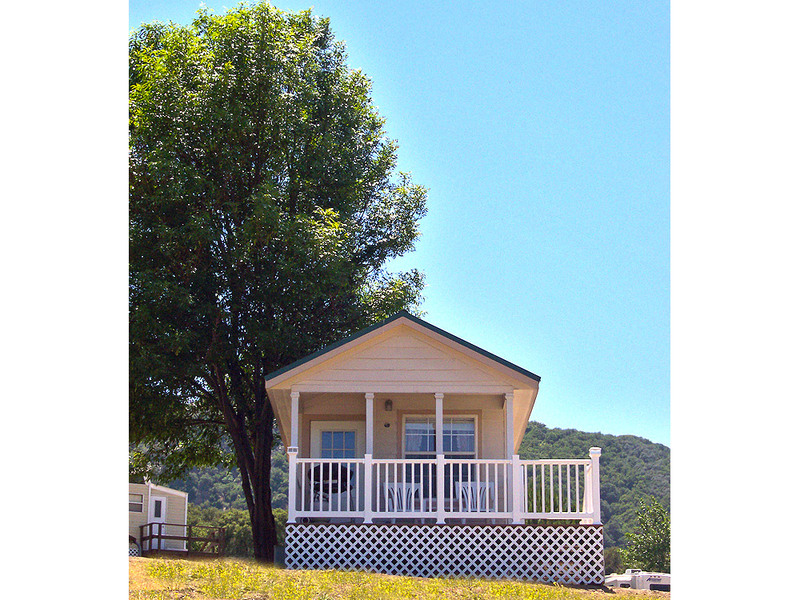 Pets are welcomed in these cabins for an additional fee. See above below "Rentals" for other information about pets in our rentals. These cabins sleep up to 4 people and include a double bed and a bunk bed. All beds are made up with sheets, blankets, pillows and spreads. Towels are not included. Restrooms and hot showers are less than 60' from the cabin. No pets in these rentals please. Although we do not allow pets in these rentals, we do allow service animals and a service animal may have stayed in a Western cabin.